The National Progression Awards (NPAs) in Sports Coaching (UKCC) at SCQF levels 4, 5 and 6 (UKCC Levels 1, 2 and 3) give a cohesive structure to coaching, from enthusiastic amateurs to experienced professionals. The NPA Sports Coaching (UKCC Level 1) at SCQF level 4 introduces new coaches to the role of coaching as defined by the Scottish Governing Body of Sports Guidelines. The NPA Sports Coaching (UKCC Level 2) at SCQF level 5 delivers the skills and knowledge required by coaches to plan and deliver coaching sessions while not directly supervised, but as stated within the Scottish Governing Body of Sport Guidelines. These qualifications are delivered through the centres who work with Sportscotland and the Scottish Governing Body of Sport. These NPAs have been mapped to the National Occupational Standards (NOS) and are aligned to the United Kingdom Coaching Certificates (UKCC). Disclosure Scotland legislation must be adhered to if candidates are working with children or vulnerable groups. The NPAs in Sports Coaching are designed to give candidates valuable, practical skills to better prepare them for a career or for further study. Attainment is recognised by employers, schools and other educational bodies. The NPA at SCQF level 4 is suitable for over 90% of those involved in sport. They are suitable for anyone who aspires to be a coach and wishes to learn by assisting in the coaching process. Candidates may still be at school and have a keen interest in sport; they may be HNC/HND candidates; or they may have been involved in coaching without having formalised their experience and knowledge. Candidates at SCQF level 5 will already have experience of the sporting activity and of coaching, and will now be looking to work with a higher level of autonomy, but still with some support. SCQF level 6 candidates will be capable of supporting less experienced coaches and colleagues, and candidates will require sufficient experience of coaching to allow this process to take place. Access is at the discretion of the centre. Candidates do not require any formal entry qualifications, but Scottish/national governing bodies may wish to set a minimum entry requirement. Level 5 and 6 candidates will be expected to have completed or have demonstrated the skills and knowledge of the previous level. 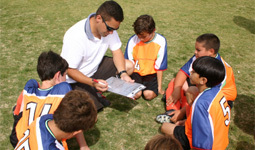 Coaches require a recognised qualification and these NPAs fulfill that requirement. If in time a licence becomes mandatory to undertake coaching, these NPAs may become essential for coaches for insurance purposes. These NPAs could open up employment opportunities with local authorities in Scotland and sports clubs as coaches are required for all sporting activities. Level 4 and 5 candidates can progress to the next level of NPA, and candidates at all levels can progress to HNC/HND in Sports Coaching with Development of Sport, or the SVQs in Coaching at level 2 and 3. The NPAs in Sports Coaching at each level have an identical structure, and are designed to build upon the previous level of skill, knowledge and competence. Units do not necessarily cover the same ground as the preceding level. The NPA qualifications in Sports Coaching at SCQF level 4 have threee mandatory Units (12 SCQF credit points). The NPA qualifications in Sports Coaching at SCQF level 5 have two mandatory Units (12 SCQF credit points). The NPA qualifications in Sports Coaching at SCQF level 6 have four mandatory Units (24 SCQF credit points). Candidates will be assessed and supported over a period of time, mostly in the form of practical tasks. While e-assessment generally will not be appropriate, some of the underpinning knowledge may be assessed in this way. At level 4, evidence may be recorded in a logbook with the assessor giving guidance and feedback on each stage of the candidate’s progress. At level 5, assessment will take place over a longer period to allow for development and to ensure the candidate is competent to work on their own with athletes.